harry potter | Srishti smiles away! Life lately has been pretty much upside down with all the Stranger Things happening around, but I’ve gotten used to it. Was that a pretty pathetic attempt at being funny while opening a blog post , which has been due for an year? …. Okay I get it… you don’t need to answer that! I see my last post here and I see 22 year old me trying to be all wise and smart and, 23 year old me , right now, is just cringing so hard. But damn that girl was wiser than me, whatever happened to her. Anyway, so I was saying … life here is killing me. I remember during my last few days at college, I was starting to get mixed feelings. Of course I was upset, but there was some part of me which constantly screamed NO ASSIGNMENTS NO EXAMS, and that just got me ‘elated’, every single time. And 3 months after that, I forgot what that word felt like. Life has become a constant cycle of work-eat-sleep-repeat and I’m just spinning with it. And not to sound very sentimental and cry-ey about it, most of the time I just pass it with a ‘K Whatever attitude‘ , except on a few days when I come back a bit late from work and I can smell something good cooking while walking past every damn house/flat in my society and I reach my place, stuff my face with cold bread and butter and cry myself to sleep on those nights. Actually , no that’s not true, I’m just being over dramatic, but you get my point, right? For twenty two years , I’ve lived surrounded with people, and suddenly there’s so much peace and quiet in my life that I just find hard to digest sometimes. (TBH, being an introvert helps a lot but not always). So, to solve that problem, I signed up on some extra courses, and long story short , it’s just more assignments and work life + student life going hand in hand. I don’t know which one I’m doing part time. So that’s enough about career. Moving on, how can I not mention? BOOKS!! I haven’t read a lot lately, but ALONE IN BERLIN by HANS FALLADA? Man, that book gave me chills. That’s another addition to my favorite Nazi themed novels. Just a fun fact, this masterpiece was written in 22 days. 22 DAYS!?!?!! I mean you really really have to read it to know how good it is. If you’re into reading, better get your hands on it ASAP! If you’re not, well… you have my sympathy. I’m also trying to finish Cosmos by Carl Sagan and Made In America by Bill Bryson, since foreverrr, but something about non-fiction, it just takes me soooo long!! Oh and I also finally read Catch-22, and I know I’m so late to the club, BUT WHAT A FIVE STAR BOOK THOUGH! *Tosses it on my pile of favorite books*. There might be around 10 , maybe 12, books more, but I can’t think of anything to specially mention. I can’t think of anything to add more now. I would tell you about the time when I cut my feet with glass and just went to sleep leaving it bleeding like that because I’m clumsy and ignorant like that (Ha! Talk about adulting), or maybe that time when I felt so heartbroken for Cassini, a spacecraft’s, self destruction that I ranted about its ‘suicide’ for half an hour over call to my brother because I become an emotional mess sometimes, but those stories are much too random and much too long to accommodate in this post. So much… SO MUCH has happened in this past one year, that I just can’t pick my favorite stories to tell. Should I mention those about my travels, or about my work or all the random batshit crazy experiences I’ve had? *pulls out my 2017 journal, looks at the number of pages, keeps it back*. Maybe some other time guys. I’m just going to end this here. Have a good night/day, if you’re reading this. Cursed Child – Because I need to talk about it. It’s been 2 months since I read this book and I’m still not over it yet. As much as I was pissed off at this piece of pure disappointment, I didn’t write about it until now because part of me didn’t want to talk about it. After me and my brother read it, we vented out our anger for this book for one hour and then promised each other that we’ll just pretend that this book never happened. As much as I’m saddened by the story they gave us, I’ve come to realize that so many people around me actually liked it. That’s part of the reason why I’m writing this post now, after so many days. One of my friends finished this book yesterday, came to my room and said “I loved it so much, I wish they would make a movie on this.” and I just sat there thinking…”Wait, are we talking about the cursed child here? But … but how do you not see that there’s so much wrong with this book? Are you kidding me?” Although I didn’t say that, because she was not the first person to tell me that. While one of my other friends described it as ‘breath of fresh air’, another described it as ‘awesome!’. I don’t understand how they fail to see what’s wrong with this book and neither do I try to understand. But yes, I do understand why has it been so difficult for me to make peace with this book. If you haven’t read the cursed child yet, maybe now would be a good time to stop reading this post now. SPOILERS AHEAD! First of all, I don’t know what characters they wrote in this book, but they definitely weren’t the same ones I grew up with. Harry can’t talk like that to his son. Harry can’t talk like that to Professor McGonagall. Not just Harry, everyone. The way they talk, the way they react to things, everything they did, it wasn’t just relate-able at all. Prototype time turner? Are you joking? We all know time turners could let them stay back in time for more than 5 minutes. Are you trying to tell us that the only time turner that was left, the last one, was the prototype one with a restriction of 5 minutes? Okay, even if it was, I think it would’ve taken more than 5 minutes for Scorpio to go back in time, meet Ron, Hermione and Snape, explain to them the whole situation, do the task he was intending to and come back again. Let’s talk a bit about Hermoine here. Minister of Magic, brightest witch of her age… you would think she would be capable enough to put protection charms in her office, which would be beyond two 14 year olds to break. Wouldn’t you? And Ron? Just because he wasn’t an auror or minister of magic or whatever and ran a joke shop, doesn’t mean you’d portray him as nothing more than a comic relief. Don’t tell us you reduced him to that after everything he had done for Harry and for the wizarding world. Oh and, can somebody please explain how in this world Harry could speak parseltongue even though the horcrux in him was destroyed ? About the big revelation in this book, Voldemort and Bellatrix’s love child, Delphi… okay first off, Voldemort wasn’t even a human himself, how could he give birth to another human? Second, WHEN DID THIS HAPPEN? Where does it fit into the timeline? After escaping azkaban, and before her death, Bellatrix hardly had two years, during which she was working as Voldemort’s right hand. When did she get time to get pregnant? If Delphi was born just before the Battle of Hogwarts, wouldn’t Harry, Hermoine and Ron have noticed her pregnancy in the Malfoy Manor? More than the whole Delphi issue, what pisses me off even more is that they made Cedric Diggory into a death eater in alternate universe, just because he was humiliated. I mean shouldn’t Neville be a death eater too by that concept, since he has been humiliated more times in the entire series than any other character? The prophecy… who made the prophecy? Where did it come from? How was Minister of Magic not aware of this, since, as I recall, Department of mysteries stored copies of all prophecies made in the wizarding world? What was the proof of its authenticity? I mean WHAT? WHY? HOW??? Making Harry watch his parents getting murdered. You know it wasn’t needed Jo. Why would you needlessly want to make his life more tragic? You didn’t have to do it. The trolley witch. ARE YOU SERIOUS?? “For Voldemort and Valor.” I almost puked. Oh and also, is everyone now comfortable taking Voldemort’s name? There might be many more other little reasons to be disappointed with the book, which I may not be remembering right now. But anyway the whole point is, this book killed my little potterhead heart. Summer 2016, Sunday morning, 11:00 am, forget about the whole post, I’m still stuck thinking about what my next line would be. Because hey, walking mundanity, that is my life. And I friggin’ love it! Straight out of the first year of MBA, or what I like to call, the grinding year, that sucked my soul like an ugly dementor. Not that dementors are beautiful, anyway, and definitely not kissable… but you get the point, right? So here I landed in apparently, one-of-the-most-happening-cities of my country, as the children these days call it (What can I say, I’m an old soul), for my internship. And I don’t challenge that title because it is the most happening, if 1. you like trekking (which is not possible in this season unless you wear a fire proximity suit… but that would be really uncomfortable to go trekking in, I reckon) or 2. if you like to drink. A lot. Which is something that doesn’t interest me. But despite that, I’m loving it here SO MUCH! One, I’m alone. Two, I’M ALONE! I mean I’ve never been this independent in my entire life. Sure, it gets boring sometimes. And I’ve had my fair share of I-want-to-go-home moments. But then, these are the two months which I’ll never forget. If you’ve still not understood why I’m so happy with my life here, I’ll set a scene for you. Books, loads of food OF MY CHOICE, HELL LOT OF SLEEP, aimlessly roaming around the city, hours of binge watching, hours of uninterrupted day dreaming, and…the best thing.. there’s no one to question. Oh and internship? Well, it’s all good. Demands me to work only about 12-15 hours a week, that too on a field job in marketing. So much exposure and so much learning in such few hours. I couldn’t ask for more. This is perfect. So long-story-short, I’m having the time of my life here. Which is soon going to end, in about half a month. And I’m trying to make the most of every single day. Books to finish, places to visit, restaurants to dine in, TV shows to watch and shop , shop, shop , before it’s all over and I’m once again caught up in the busy life of assignments and tests. So that’s all about what I’ve lately been up to. Stay tuned for some book reviews, maybe some artworks, and random rants about random stuff. 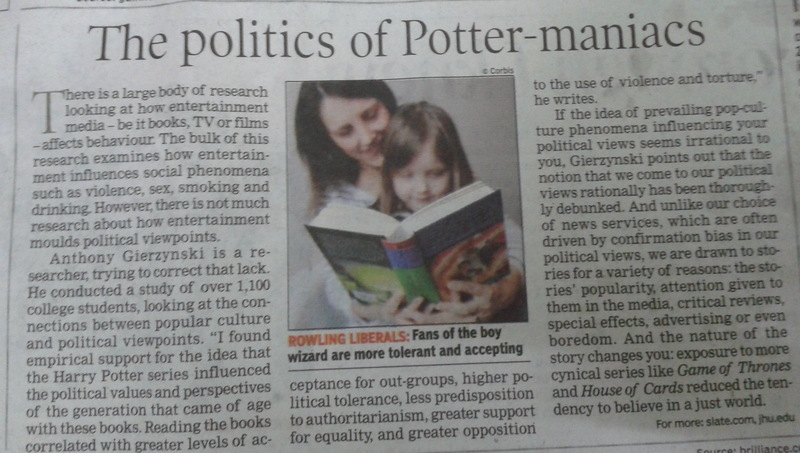 This was in the news last sunday and it has been doing rounds on all social medias since last week, and I thought, being a potterhead, it was only fair that it should be on my blog too, because, honestly, this book has shaped half of my ideas and perspectives about world and life in general. And this is also an answer to all those people who have never read these books and have always looked at it as just another ‘fairytale for kids’ and who ask me why I ‘still’ love it. I would just like to say this… pick it up and know for yourself. Shut up ! I’m NOT a grown up… yet.